Kurakkan, also known as ragi, is a type of millet that is gluten-free and diabetic friendly. 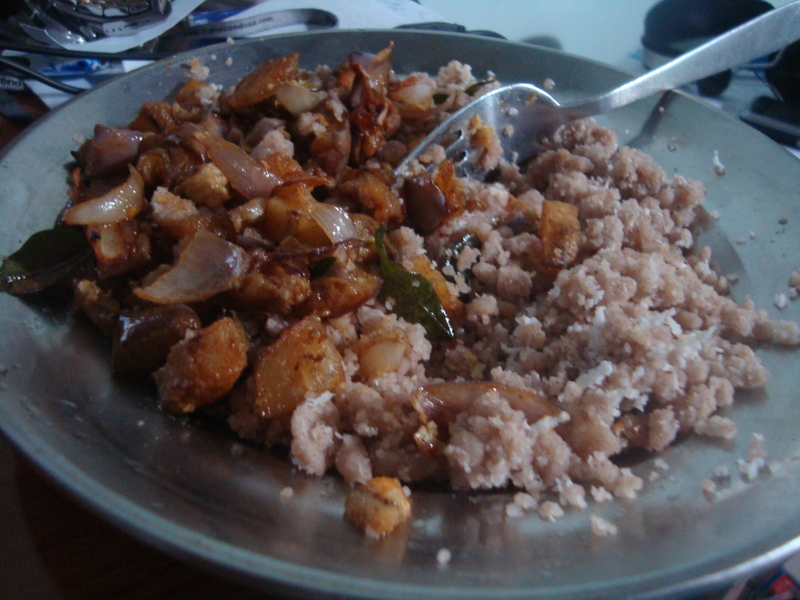 At home, the most common and popular form of pittu is the rice flour pittu. Occasionally, my mother makes the atta flour pittu or the kurakkan flour pittu. Below is the simple recipe for making kurakkan flour pittu. The rice flour pittu and atta flour pittu easily blend with any curries and is a convenient meal to prepare. Kurakkan, however, has a distinctive taste that I find does not easily merge with just any curry. 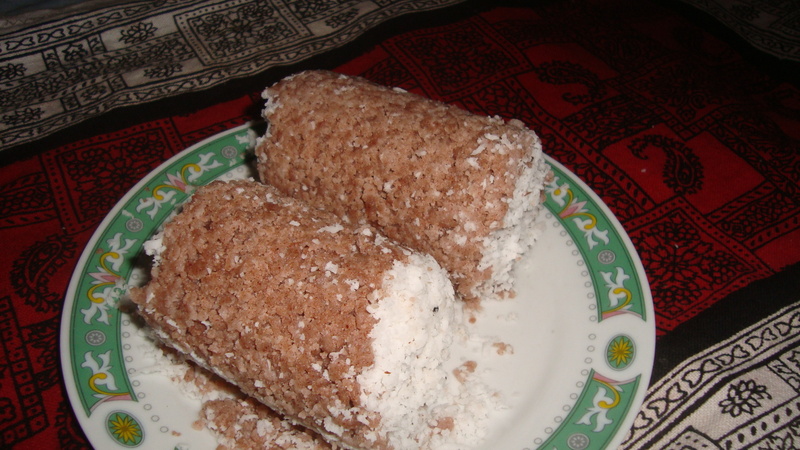 As such, I prefer to eat kurakkan pittu simply sprinkled with coconut and jaggery. Add a pinch or two of salt to the kurakkan flour. Stir in boiled and slightly cooled water until the flour mixtures becomes coarse and grainy. Steam the kurakkan pittu for 10 mins. 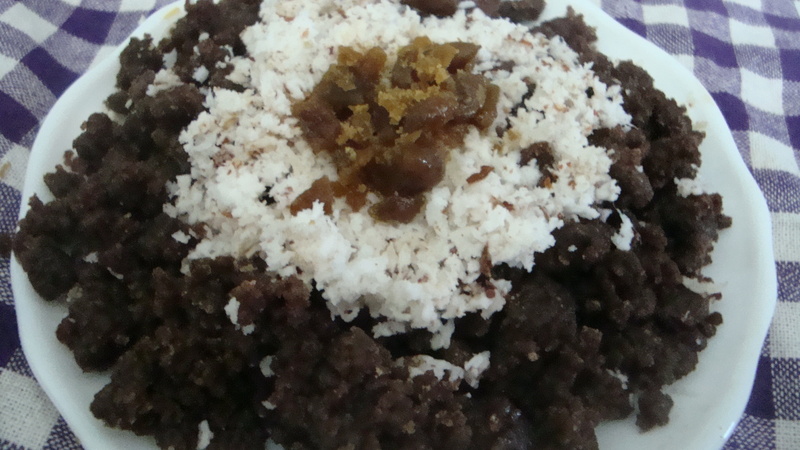 Mix the freshly scraped coconut and chopped jaggery into the steamed pittu and serve hot. 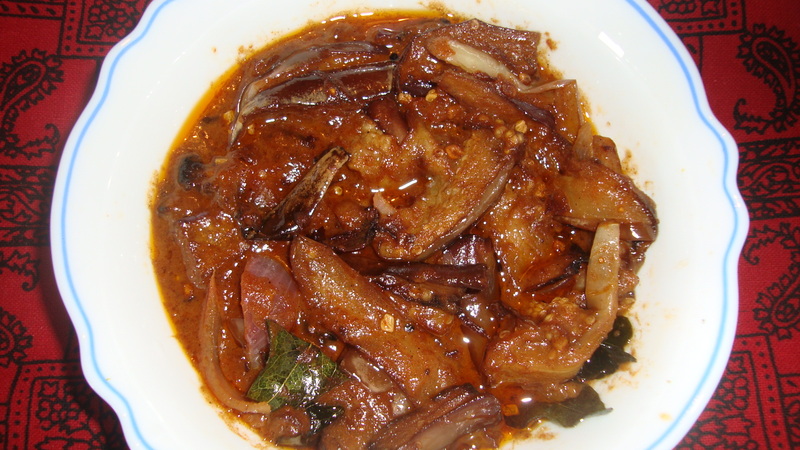 Pittu is a dish that my mother often makes for dinner. She generally makes rice flour pittu. One of the varieties that she occasionally makes is the atta flour pittu, the recipe of which is given below. Roast the atta flour over low heat for 5 mins. Remove from stove and add the salt. While still hot, stir in water at room temperature until the mixture becomes coarse, small particles. Add the freshly scraped coconut and mix well. Steam the pittu for 10 mins. Serve warm with any curry. The other breakfast treat that my mother’s friend had brought this morning was paal puttu. I have actually had a few different versions of this over the past decade. Surprisingly, this is the first dish from the northern region of Sri Lanka that I have had which my mother hadn’t either heard of or tried until I described it to her. Mix ¼ cup urad dal flour and ¼ cup rice flour with salt and hot water and make them into tiny balls. Steam the balls and keep aside. Heat the coconut milk, with the sugar and salt seasoning, in a pan. Add 2 tbsp urad dal flour to the coconut milk as it starts to boil. Stir well. As the sauce thickens, add the steamed balls and mix well. Remove pan from stove after a minute or two. Today, I felt like sharing another of my family’s comfort food. During the weeks that my mouth was wired shut after my road traffic accident nearly a decade ago, the food that I felt like eating the most was pittu and katharikkai vathakkal. It was then that I found out that everyone in my family seemed to like it very much as well. As pittu is made as either kulal pittu or regular pittu and my mother generally makes the katharikkai (brinjal) as a curry or vathakkal (stir-fry) to go with the pittu, I decided to share the recipes for all of them. Mix the roasted rice flour and the steamed wheat flour. Add some salt. Pour the hot water (boiled and slightly cooled) slowly into the flour mixture and stir by hand till you have coarse, little balls. Divide into three sections of flour mixture.Divide the freshly scraped coconut into four parts. Take the bamboo steamer and layer the bottom with one part of the freshly scraped coconut. Then, take one of the divided sections of flour mixture and fill in the bamboo steamer. Layer again, with the second part of scraped coconut. Repeat for remaining two sections of flour mixture until the bamboo steamer is filled but not overflowing. Top with the final part of the scraped coconut. Steam for 10 to 15 minutes. 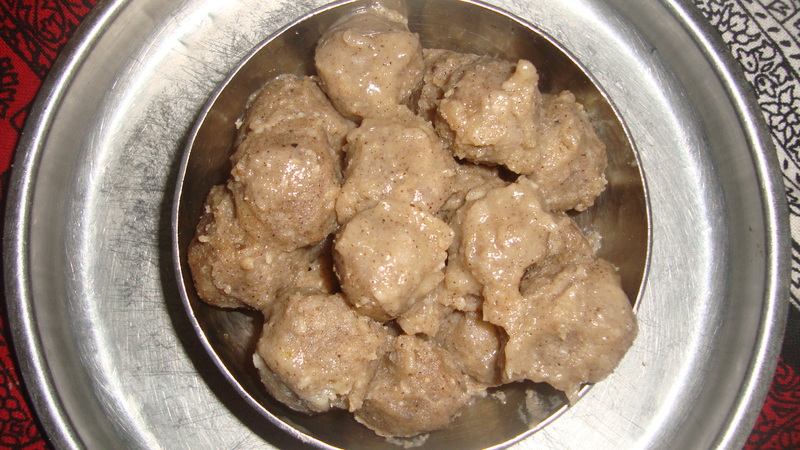 Serve the kulal pittu with katharikkai kulambu. Cut the brinjals into 1 or 1 ½ inch thin slices till you have about 2 cups. Deep fry the brinjal slices they brown and keep aside. Heat 2 tsp oil in a pan and sauté the onion and curry leaves with the fenugreek seeds for a couple of minutes. Add the brinjal slices to the pan. Mix and fry for a few more minutes. Add the ½ cup of tamarind extract and simmer for a few minutes before adding the coconut milk or non-fat milk and the curry powder and salt, to taste. Let the curry simmer for 10 minutes. Finally, add the sugar, mix and quickly remove from heat. For curries that use tamarind, it is good to add some sugar at the end, just before removing from the stove, as it enhances the flavours. For the regular pittu, follow steps 1 and 2 as for the kulal pittu. 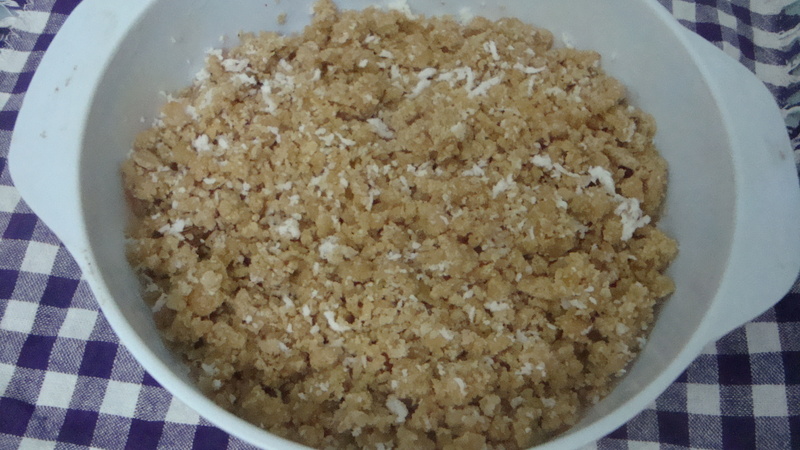 Then, mix in the freshly scraped coconut into the bowl of tiny flour balls. Steam the pittu mix in a normal steamer for about 10 – 15 minutes. Wash and clean the brinjals. Cut the brinjals lengthwise and then finely chop them into small pieces. Sprinkle some salt over the chopped pieces. Mix and keep aside. Finely chop up the onion and chilli. Heat 2 tbsp oil in a pan. Add the chopped brinjal pieces to the pan and fry them for 5 mins. Add the chopped onions and continue frying for another 5 mins. If needed, add a little more oil. At the end, add the curry powder, mix and fry for a couple of minutes before removing from heat. Serve the pittu with the katharikkai vathakkal.